We've all heard it before, but I just love saying it again. Drinking more water always helps with weight loss. It's also one of the easiest, convenient and cost friendly ways to help you shed pounds. This is almost fool proof for weight loss and since the weather is beginning to warm up it becomes even more important to keep our bodies well hydrated. It's no secret that drinking plenty of water has several benefits, especially when it comes to losing weight. As simple as it’s clear, next to oxygen, water is the most important thing we need for survival. We can even survive without food for many days, but not without water. It hydrates us, helps carry nutrients, detoxifies the body, and increases the body's metabolic rate. Hopefully it will become second nature to hydrate your body throughout the day. Whether we drink it directly out of our taps or choose to buy bottled varieties at the supermarket, it is easily attainable and can cost you a little or absolutely nothing, depending which one you choose. Drinking a glass of water before eating a meal helps make you feel full. It's a great way to eat less and an easy way to reduce calorie intake. That's what makes water so great, it has zero calories. Drinking water before a meal also helps prepare the body for the digestive process. Instead of sweetened fruit juices or sugary sodas, replace them with water. How to make water taste better without adding lots of calories? So if you enjoy a cola or carbonated drinks, switch your sweetened bubbles for a refreshing bottle of sparkling water. You can always add a nice slice of orange or lemon which will only add to the benefits. 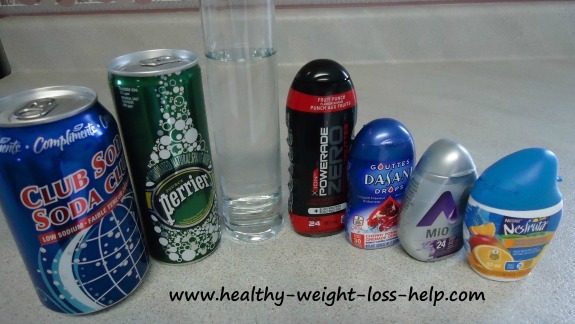 Whether it is a brand name or no name product there are many zero calorie flavors available to enhance the flavor of your water or soda water. If drinking water is just too bland, or hard to take, then flavor it with a water enhancer. There are lots to chose from at most supermarkets. Try to get the kids to drink flavored water or soda water instead of pop. Studies have shown that this one simple step has helped prevent child obesity. 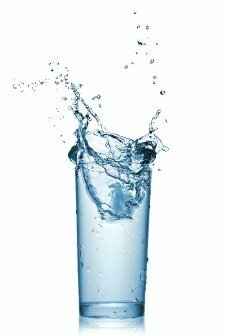 It's another great way how water and weight loss go hand in hand. 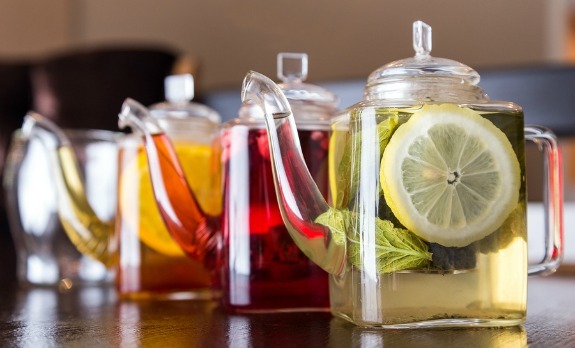 There are a wide variety of teas to choose from that all give water a special flavor, aroma and certain health benefits. Some of them taste absolutely divine. A little more flavor for water and weight loss. Tea is great because you can enjoy them hot or cold. You can also add lemon (and a sweetener if necessary) or just drink them naturally. Whatever the case, it is a great way to hydrate your body. Also green teas seem to be at the top of the list when it comes to weight loss as they help increase metabolism and according to some recent studies offer cancer fighting properties. Lemons are not only loaded with vitamin C, they help cleanse and activate the liver. This in return helps the body flush out unwanted toxins and boosts our immune system. Reducing toxins in the body which help keep your skin radiant and healthy looking and will fight the aging process as well. Improved liver function is known to help with weight loss success and a big glass of lemon water can help fill up our tummy’s so we eat less or wait longer before eating, both helping with weight loss. There are lots of ways you can enhance and infuse water to spice things up a notch. 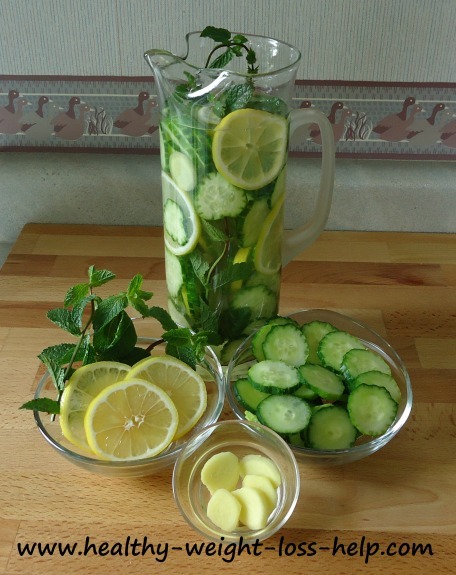 In the picture below, we have added cucumber, mint, ginger slices and lemon slices to the water to achieve added flavor. Cucumber water is fun and if you want to get the full nutritional benefits, you have to eat the cucumber slices as not much gets released into the water. I consider this both a healthy snack and beverage. If you can manage it, try not to drink any liquids during meal time as this dilutes your digestive juices. Wait at least 30 minutes after meals before drinking any liquids is ideal. People ask me, what kind of water should I use? Distilled, filtered, reverse osmosis, spring water or water from a Brita is all nice choices. I am not knocking tap water, but it does contain chloride, which doesn't always taste that good. Use what works best for you.